Words evade me. There is absolutely no way I can actually convey my love of this book. It broke my heart, it made my angry, and brought me to tears, but at the end of this story my heart was so full that I thought it would burst. I swear to all that is holy that Rachel Van Dyken broke my soul at the end of the last book. I felt like she crushed my heart right along with Chase’s. 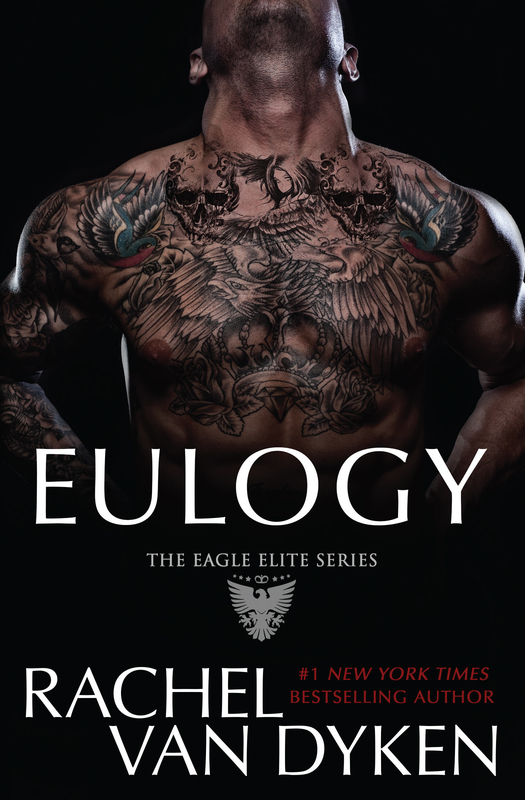 My heart bleed for him, and so when we got our hands on the synopsis for Eulogy, I was salivating for it, for him. I needed him to see him whole again, and I knew Rachel Van Dyken would put us through the ringer. Boy, did she ever with his character. From the moment Eulogy begins, his darkness is an oppressive cloud suffocating him and spreading to anyone in his path. Death and destruction is all he knows now, and it is the only way for him to alleviate any of the pain and betrayal he feels. I, honestly, couldn’t fault him for any of it. I understood. What I wasn’t prepared for is what was underneath the pain when we got inside his head. When we saw that all he wanted was to be loved, and the one thing he craved was denied to him at every turn. So many times, when he was pouring his soul out, even if it was just internal dialogue, had tears threatening to spill over. As he is forced to interact with Luciana, we see the light return, the man we have loved coming back a tiny bit. The man he is at the end is utterly consuming and PHENOMENAL. Watching him work through his emotions and lust for revenge to see he is worth more and to see him demand more is one of the most rewarding character evolutions I have experienced. Luciana couldn’t have been a better heroine for this man. She is the opposite of his wife who betrayed him. She is sweet and innocent, and her light draws him in and soothes his soul. She provides him moments of peace. Luc is so much more than this, though. She is a heroine who is not outwardly strong, her strength lies within, and her ability to love through fear and death makes her one of the strongest heroines I have encountered. I love her for her fortitude, but also for the way she understands Chase, for the way she doesn’t run, and for the way she fights for him no matter what it does to her emotionally or physically. She is perfect in every single way. This story is so much more than mafia revenge. Don’t get me wrong, Eulogy still provides violence, death, family meetings, and everything we love about this series and mafia stories in general. It is just more. It is a story about redemption, and not redemption in the eyes of others but redemption for oneself. Chase has only ever wanted to be loved, and when the author peels back the layers of his past relationship to show how much he really craved it and how much the betrayal truly altered it and changed his perception, it will flay you open. Luciana along with the readers begins to understand what holds him the darkness because she has felt what is like to want to be loved and accepted and cherished. Watching these two come together is truly magical. His fight to stay in the darkness and her fight to bring him to the light is filled with angst and pain, but ultimately RVD doesn’t let her readers down. She gives us an ending that is true to the mafia storyline but also an ending worthy of one of the best characters and romances I have a read in some time. Anger. Revenge. Love. Healing. Redemption. Rachel Van Dyken crafted a story that will shatter your heart and then give you the needle and thread to sew it back up again. With Chase’s story, we truly get to see the death of the monster he has become and the rebirth of the man he was always destined to be, and with this rebirth I have found a new mafia romance favorite. No one does it better that Rachel Van Dyken. Get your copy of Eulogy today! Love love love!! I adore this series so much!! This review 😍 wow .. I was not sure that I wanted to read it because I’ve been disapointed in some books from Rachel Van Dyken but now after readind what you wrote… I can’t wait to dive in !!! Ugh I need this WHOLE series! I started with book 7, and I have been picking up the other ones as they go on sale.